Coby Richter, DVM, DACVS, writes of a dog who sustained multiple skull fractures following an accident. Diagnosis, advanced imaging, surgery and nursing care helped him return to function. A 2-year-old neutered male Irish Setter presented to an emergency clinic after leaping from a moving vehicle (estimated vehicle speed 25 mph). At presentation he exhibited multiple soft tissue and bone injuries to his face with minor abrasions to his limbs. He was stabilized with pain medications (hydromorphone and meloxicam) and given IV fluids and antibiotics overnight. He was transferred to DoveLewis about 18 hours after initial trauma for computed tomography and surgical treatment of the head trauma. During the initial stabilization, no neurologic deficits were observed, although he consistently breathed through his mouth rather than his nostrils. Upon arrival at DoveLewis, the dog was bright, alert and ambulatory. He had active hemorrhage from both nostrils (steady slow drip) and dried blood within the right external ear canal. An oral exam was not tolerated and was planned to be performed in conjunction with full anesthesia for the computed tomography (CT) exam. External palpation of his skull revealed a lax and laterally displaced right hemimandible with soft tissue swelling around the ramus of the mandible and ventral to the left eye. Referred upper airway sounds were ausculted over all lung fields. His neurologic exam continued to be unremarkable, although swallow and gag reflex could not be assessed due to unstable mandible fractures. The clients elected to pursue CT examination and surgical repair as indicated that afternoon, approximately 24 hours after injury, as the dog remained very stable with no evidence of progressive intracranial trauma or pulmonary compromise. 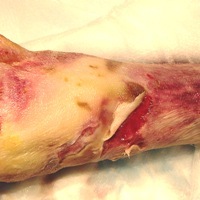 Pain management had been transitioned to a CRI of fentanyl (2.8mg/kg/hr) after arrival at DoveLewis, and he was continued on cefazolin (22 mg/kg IV TID). Anesthetic induction was accomplished with midazolam (0.2mg/kg IV) and a bolus of fentanyl, followed by propofol to effect. After intubation and initiation of gas anesthesia, a brief oral exam was completed demonstrating an open rostral mandibular fracture (right) at the level of the first premolar. The caudal aspect of the right hemimandible was also unstable at the level of the ramus. There was instability and soft tissue swelling along the length of the hard palate centered on midline. A CT scan was performed from the tip of the nose to the caudal aspect of the skull, ensuring adequate imaging of the ear canals. Significant findings included multifocal fractures involving the maxilla and hard palate (Figures 1 and 2), fracture of the vomer bone, hemorrhage within the nasal cavity and frontal sinus with turbinate crushing, left frontal bone fracture, multiple right mandibular fractures (Figure 3) and a mildly displaced fracture of the right zygomatic arch. No abnormalities were seen within the calvarium. The dog was moved into surgery where the ramus fracture was reduced via a ventrolateral approach and stabilized with a four hole titanium plate. Local anesthetic blocks using bupivicaine were performed for both mandibular and maxillary fractures prior to surgical intervention. 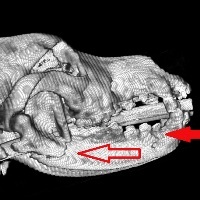 The more rostral, open fracture between the first premolar and the canine was stabilized with two separate cerclage wires of 20 g wire to prevent over-riding during tightening. Finally, the maxillary fractures were reduced and stabilized with the dog in dorsal recumbency using a K wire and figure of eight cerclage wire. 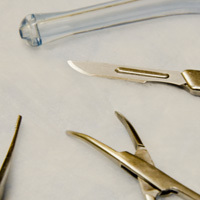 The nasal passages were gently lavaged to remove any free turbinate fragments. The zygomatic and frontal bone fractures were evaluated but found to be adequately stable and minimally displaced. The dog recovered smoothly from anesthesia, aided by a single dose of acepromazine (0.5mg) and judicious use of the fentanyl CRI. 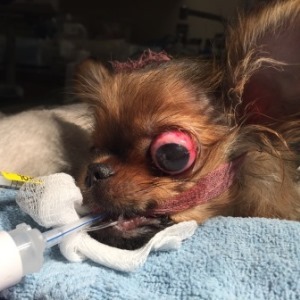 He began to eat soft food 24 hours after surgery and was transitioned to oral medications. He was discharged 36 hours after surgery on oral antibiotics for one week, NSAID for 10 days, gabapentin for two weeks (2.8mg/kg PO BID) and fentanyl patch. The hard palate wire and mandibular cerclage wires were removed seven weeks after surgery at the referring veterinarian’s clinic. All fracture sites were stable at that time based on palpation. Discharge instructions included soft food for at least 2 months, no access to chew toys or other scenarios that would encourage heavy motion of the jaw. The owners were warned that chronic sinusitis may be a problem with the dog given the severe turbinate damage seen with the CT scan. At eight months post surgery, they reported no ill effects and he has shown no sinus related problems since wire removal. This case demonstrates the utility of computed tomography when presented with head trauma resulting in complex fractures. Skull radiographs can be challenging to interpret in even the most straightforward cases due to the intricacy of bones in many overlapping planes. In this case, the CT allowed surgical planning (implant and surgical approach selection) while assessing calvarium and turbinate damage and expected airway compromise. A focal CT scan such as the one performed on this patient generally takes less than 15 minutes to perform and can safely precede surgical repair with minimal additional anesthetic time and risk. Both radiologist and surgeon were present during the scan allowing for immediate discussion and efficient planning. Three-dimensional reconstruction is possible through the use of a software program that stacks the collected CT images. The resulting volume can then be manipulated both spatially and with respect to density to optimize views of the key anatomy. 3D reconstruction is particularly advantageous in areas of the body like the skull and pelvis where the information gained from standard orthogonal radiographs can be tough to translate into what should be expected at surgery. DoveLewis would like to thank the Central Oregon Veterinary Group for referral of this case and Riley’s owners for consenting to the use of his case as an educational tool for our veterinary community.